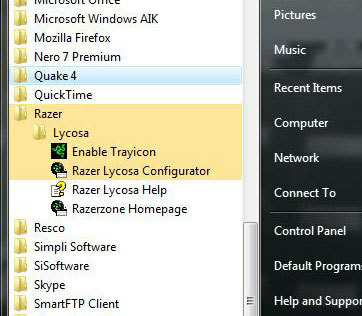 After plugging the RAZER Lycosa into my Vista Ultimate based PC - AquAus, it was immediately recognised. 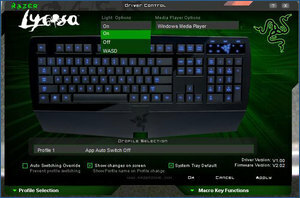 RAZER includes a keyboard driver and driver control configurator on their install CD which must be installed in order for all the features of the Lycosa to be useable. 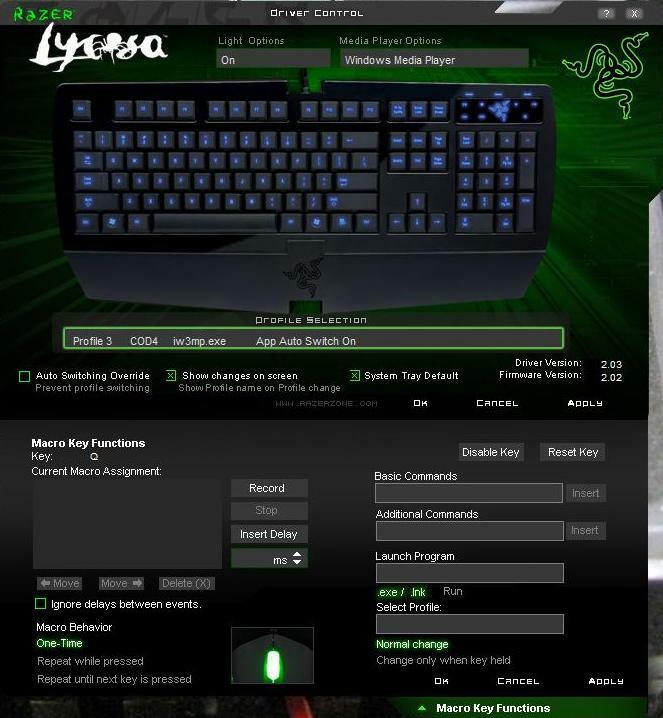 You can use the Lycosa without the features offered by the driver, but that would be kind of pointless. After installing the software and restarting the PC I took a short trip to my 'Start Menu' to see if any other software was installed during the procedure. 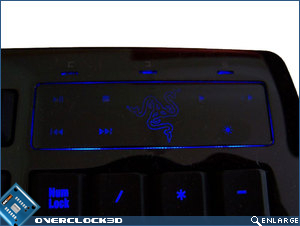 I'm happy to report that RAZER has seen fit not to include additional useless crap with their drivers; unlike some other keyboard manufacturers. 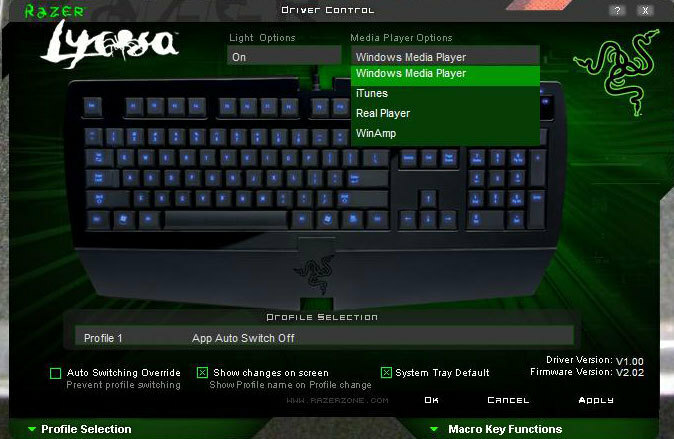 The driver includes a small RAZER logo icon in the system tray which provides access to the 'Driver Control' panel. The Driver Control panel allows for configuration of the RAZER Lycosa; changing of profiles and deployment of macros should the urge grab you. 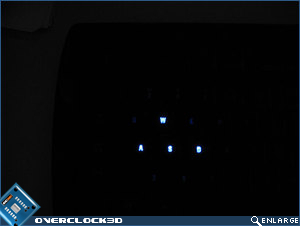 At the top of the Driver Control panel you can set the Lycosa' backlight to being on, off and a slightly weird WASD configuration. 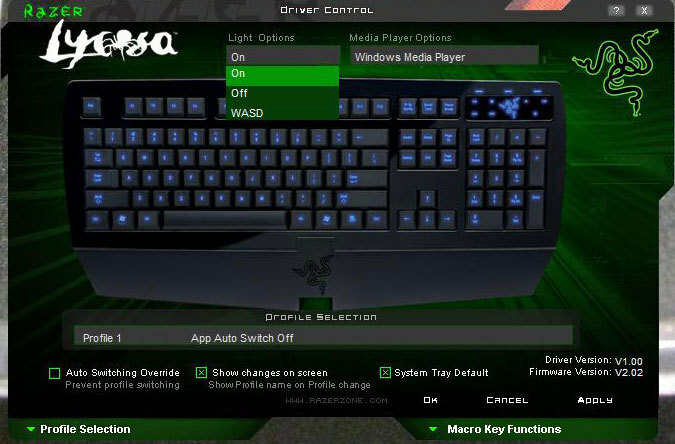 I'm not quite sure of the WASD setting, as every game that I use needs more than those four keys. 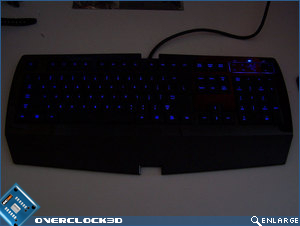 Plus having the WASD keys lit, but the rest of the keyboard blacked out tends to make finding other keys a little tricky in dimly lit, or no light situations. 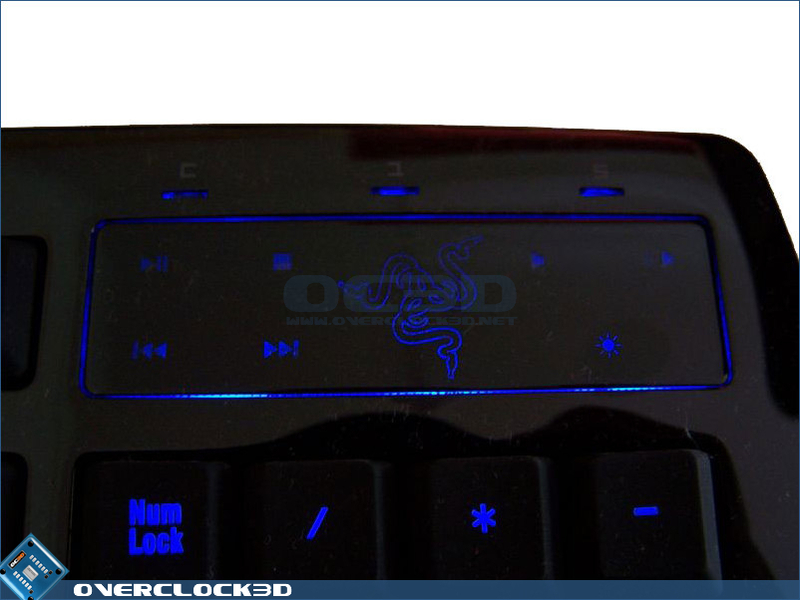 The RAZER Lycosa has the ability to control software audio players courtesy of the onboard touch sensitive panel. Support for the four major players out there has been included - Windows Media, iTunes, Real Player and Winamp. At the bottom left hand corner of the Driver Control panel we can see the Profile Selection tab. 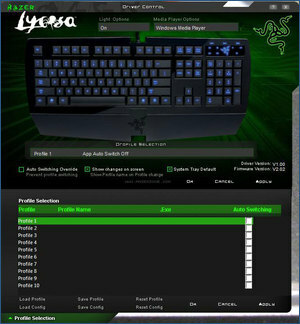 The Profile Selection tab allows you to make up to ten personalised profiles for your keyboard. 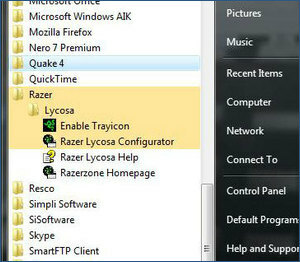 The beauty of the RAZER Lycosa as far as profiles are concerned is that you can set the profile to start from the moment that a program is launched. 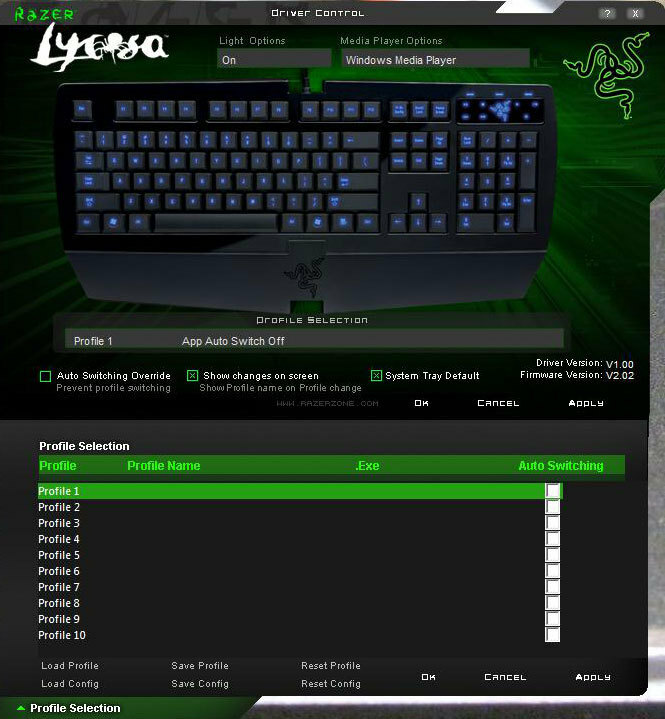 As well as editing the profiles to your own personal preference, the RAZER Lycosa allows you to include macros as part of the profile. 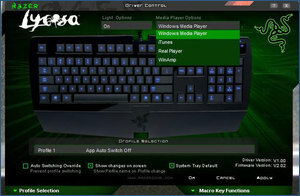 The Macro Key Function tab gives you the ability to store different profiles for different applications or games. Each of them holds macros, which are specific chains of key presses. 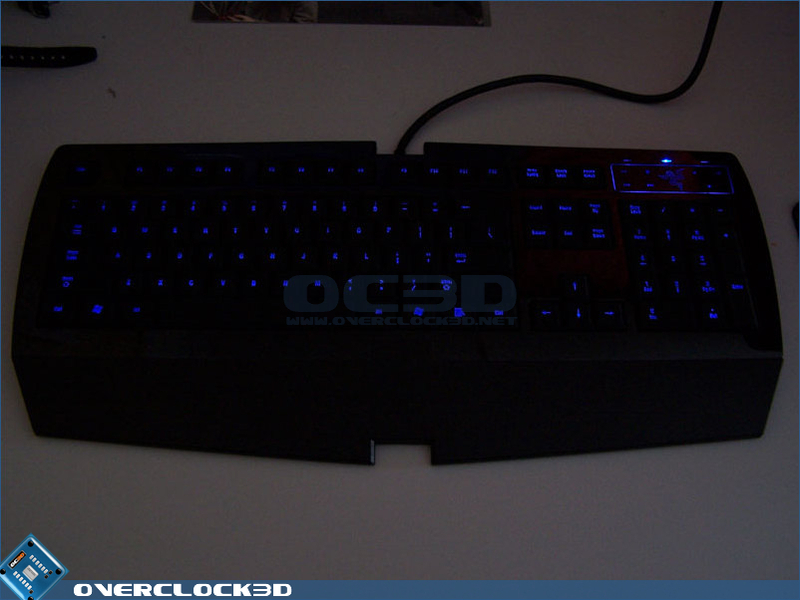 With these macros, you can bind actions like buying weapons and armor in Counter-Strike to a single key. 1. The extra connectivity bits on the back for headphones/USB... etc was detachable from the main cable, i have no need for either, and just gets in the way. 2. 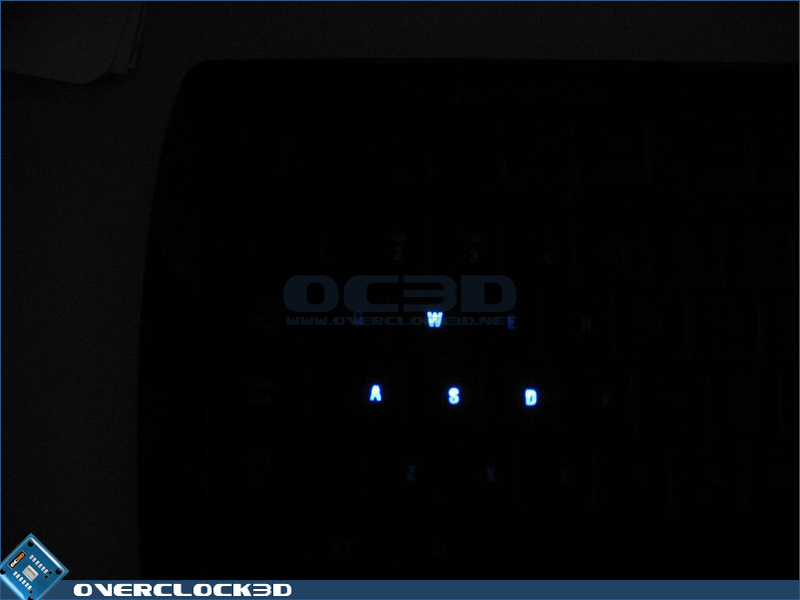 There was a luminosity control for the back light as in strong daylight it gets quite dimmed.